Since late last year, Enact Solutions has been working with South London and Maudsley NHS Foundation Trust putting together an Inclusive Leadership training programme with a difference to help them achieve 3 key aspirations for BME employees. The pilot stage took place last week, and the first of 20 sessions for all staff with leadership and managerial responsibilities will shortly get underway. Also, in March, there’s a complimentary (no charge) event to tell interested NHS Trusts about the work. To throw some light on what goes on behind the scenes with a job like this, we asked Rosie Perkin, Creative Director, a few quick questions. So, Rosie, all the pilot sessions for South London and Maudsley NHS Foundation Trust’s Inclusive Leadership programme have now been completed. How’s it gone? Really well. The feedback from both the senior leadership team and the diversity team was all highly positive. ‘This was exceptional’ was just one of the comments we received. When you are working with mixed teams of people it’s always a challenge getting the scripts spot on, so everyone can identify with the characters, the behaviours and the situations. This is really important as it enables individuals to easily translate their learning back to their own working environment. There were no script changes needed which is always a relief to the actors at this stage. Very little else was changed, a few minor tweaks here and there just to make sure it will achieve exactly what they need it to. Everything is falling into place nicely then? So, what’s it meant to achieve? What does success look like for the Trust, and for you as the creative force behind it all? Okay, so this piece of work supports the start of a four-year programme of change for the Trust. 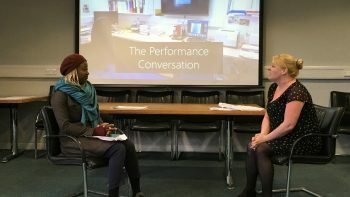 Whilst the sessions as a whole look at Inclusive Leadership and what more we can be doing as leaders to ensure we are promoting a healthy, happy inclusive working environment, there’s a clear focus on changing the face of diversity within the workforce; particularly the higher you move up within the organisation. At the moment, approximately 53-57% of the local population, the people this Trust serves, are white. Just under 40% of the workforce are from Black, Asian Minority Groups. As you move higher up the organisation this representation drops to as low as 8% – that’s at Board level. So, how can we be sure we are driving and implementing decisions that best reflect the community we serve? This was one of the findings in Roger Kline’s work, Beyond the Snowy White Peaks of the NHS, in which he identified 7 areas related to race inequality that were potentially impacting on patient care. Our client has made a commitment that before 2021 they will have proportional representation at all levels across the trust. I’m proud that we are supporting the start of that journey, engaging with leaders to consider their inclusivity and the part that they will play in achieving the Trusts aspirations. We’re calling it a ‘training programme with a difference’; what exactly sets it apart in your eyes? What kind of experience can participants expect? The three hours that they are with us will absolutely fly. From the moment they are in the room it will feel different. There are lots of activities to get them up on their feet, engaging them to think about how they see things and how they might view things differently. Although they are never asked to role-play, so they are safe, it is hugely participatory and experiential. Working with actors is one of the most engaging ways to really get to understand what it might be like for someone different to you working in a similar environment. I truly believe we open their eyes to seeing the world differently. We blend this with paired and small group work so everyone feels they can contribute in a way that makes them feel comfortable. And the client, presumably they’ve been closely involved in the creative process long before the pilot? Yes, and that’s exactly how I like it. I encourage them to be as hands on as possible. The more involved a client, the more we understand exactly their needs and what they want to achieve. Either myself or one of the creative developers work closely with all clients from the outset to make the project the very best it can be. What’s your favourite part of putting together a programme like this? [Laughing] It’s easy to let the ego come in to play and say ‘See that there? I made that!’ But it’s much bigger than that, why we do what we do. Because we want to make a difference. That’s my measure of success and what gives me personal satisfaction; knowing the long-term changes that a client will see are, in part, because of our intervention. It all sounds very bespoke; would it work elsewhere? Lots of organisations, not just NHS Trusts face similar challenges. Of course, Inclusive leadership is the future! And whilst there is lots of research around NHS organisations and why this is important, actually what we are talking about is every single member of any organisation feeling engaged, respected, listened to and with a fair opportunity to develop – show me an organisation that has nailed this and I’ll apply to go and work for them [laughs]. What’s next then? Is your work here done? Well, there’s lots to do, projects to create around difficult conversations, unconscious bias, bullying and harassment, but, that doesn’t mean to say I’m leaving this one behind! I will be observing the programme once it’s underway. I love to see how it develops once it’s been run with delegates a couple of times. I make sure I get out to see the sessions to make sure they are still on point, doing what we need them to do and keeping them fresh. I don’t think we can ever sit back and think that something is good enough, I’m constantly looking at ways we can tweak things to make them even better. Great stuff. Thanks for lifting the lid on some of what goes on behind the scenes. We obviously hope it all goes well. Thank you! I’m confident it will. Enact Solutions and South London and Maudsley NHS Foundation Trust are running a complimentary (no charge) event about our Inclusive Leadership Programme in London on Friday 2 March 2018. Places are limited, but when they run out we will be running a waiting list in case any become available due to cancellations. Also, do feel free to contact our Creative Director, Rosie Perkin, directly if you’d like to discuss any aspect.